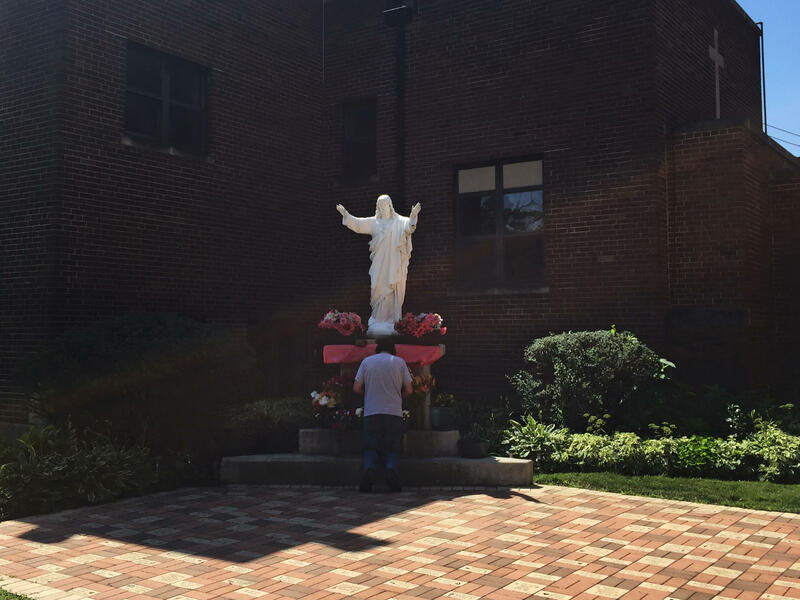 Retired truck driver Frank Rivera, 63, prays at the grotto of the Sacred Heart in the courtyard of St. Alexis Catholic Church, Bensenville, Ill. About half of Bensenville's residents are Latino, many of whom were born here or came to the U.S. decades ago and are U.S. citizens. Worshippers at St. Alexis pray during a Spanish-language Sunday Mass. The Rev. Matthew Nathan celebrates a Spanish-language Mass at St. Alexis. "I'm sorry," she says in broken English, as she chokes back tears and struggles to find words. "It's ... emotional ..."
The scenes of mothers and children being separated remind Sarah of her own border crossing 15 years ago, when she had to leave her young daughter behind for a time. They were reunited in Chicago, where Sarah and her husband have since had three more children, who are U.S. citizens. Sarah asked that we not use her last name because she now fears more than ever before that she and her husband could be deported, and their family torn apart. She says those constant worries are affecting their health. "There's a lot of stress; my husband's very stressed," Sarah says through an interpreter. "He'll sleep for like a little bit, and then he'll wake up. He has a lot of headaches and it's hard for me to sleep." Sarah says her children, too, get anxious every day when their father leaves for work. "They're very worried that their dad won't come home," she says. Sarah says she tries to shield the kids from such worries, telling them everything will be OK.
"[But] they know what's going on. It's very worrying for them. ... We try to just live and keep going, but that's no way to live." It appears such worries are on the minds of many immigrants these days. It's reflected in the first question many of Hannah Bonifacius' students ask before she starts classes teaching adult immigrants English as a second language. "'Did you see the news last night?'" Bonifacius says, adding, "That's one I get a lot — 'Did you see the news last night?' And I take that many times and say, 'Which story?' And it's always about immigration." The other frequent question she is being asked is, "What's happening?" Many of the immigrants in her classes at World Relief Chicago, a refugee and immigrant resettlement nonprofit, have fled violence and are already stressed out about finding and keeping jobs, housing and schools for their kids. So facing new uncertainties about their legal status here, or discrimination and demeaning rhetoric, can be traumatizing. "Our current climate is affecting their mental health, for sure," Bonifacius says, adding that while she and other ESL instructors can facilitate discussions about the current uncertainties around immigration, they have not had training to handle their students' critical mental health needs. "We have people walking in, in crisis, emotionally and mentally. We have people calling," says Mia Fioritto Rubin, director of immigration legal services at World Relief Chicago. "We have people just desperate for an answer, and they tell us, 'I just can't be at peace until I know that my family member is coming. I can't be at peace until I know that I'm allowed to stay.' "
And Rubin says the organization's clients who are worried are not just those here illegally or waiting to gain legal status. "We have had a wave of elderly people coming to us, who have had green cards for decades, who are all of a sudden very concerned that that green card will be taken away from them, and [they] are hoping to apply for citizenship," she says. "We have people who have already naturalized and have been citizens for years who have come back to us and asked, 'Could this be taken away from me?' " she adds. "The fear is there for every single person who was not born on American soil, and even some people who were born here, but to immigrant families, there is the concern that somehow, some way, they're going to be forced to leave." The biggest fear, says Rubin, is the uncertainty of not knowing what's coming next. That, she says, is making it difficult for immigrants and their families to build their lives and is impacting their ability to feel settled. With new policies and procedures being implemented in what she calls a "capricious way," she says that fear can lead to panic, which can have significant health impacts. "We are absolutely seeing a significant increase in anxiety, depression, all the physical manifestations of that," Rubin says. "Clients reporting to us that they're having severe headaches [and] an increase in blood pressure." "We feel they are after us"
Many in the Latino community try to calm their fears with faith. At St. Alexis in the Chicago suburb of Bensenville, Ill., parishioners often pray aloud during the Spanish-language Masses for the well-being of immigrants detained at the border and for political leaders to provide justice. They seem to be lighting more candles before and after Mass, and some kneel and pray at the grotto of the Sacred Heart in the courtyard outside the church. The Rev. Matthew Nathan, pastor of St. Alexis, says he is even blessing more religious figurines that are believed to help protect families. 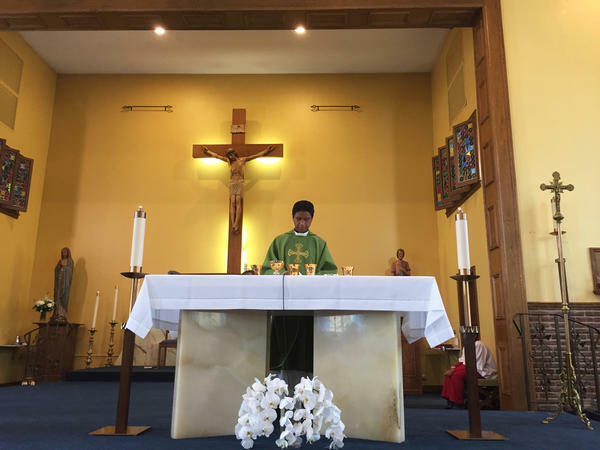 "The most common statue that I would bless after Mass would be our Virgin of Guadalupe, St. Jude, who is the patron of lost causes," Nathan says. "And I'll always get a St. Michael the Archangel, the protector of those who are being attacked." And under attack is exactly how many Latinos say they feel these days. "Oh, yes, absolutely. We feel they are after us," says Amelia Chaidez, who is 53 and has been a U.S. citizen for decades after immigrating as a child. In recent months, she says, she has felt more eyes following her around a store as she shops. And she points to viral videos of white Americans screaming at Latinos to go back to their country, even though the targets of such vitriol were often born here. "I'm beginning to worry. I wasn't worried before. I was angry. But right now, I'm beginning to worry," Chaidez says. "When I see that families are being separated? I think they're after us, I really do." What gives Chaidez and others in the Latino community hope is the strength they find in their faith, their family, their friends and neighbors. And they pray that the anti-immigrant mood in the country will soon lift. The Trump administration's practice of separating children and parents at the border was terrifying to many immigrants. Even those who are in the country legally are beginning to wonder that their families could be broken apart, too. As NPR's David Schaper reports, anti-immigrant threats and actions have many Latino-Americans living on edge. DAVID SCHAPER, BYLINE: Mexican immigrant Sarah has a hard time watching the news these days. In fact, when I ask her about it, the 37-year-old mother of four chokes up immediately, and tears stream down her cheeks. SARAH: I'm sorry. It's emotional. SCHAPER: As the scenes of mothers and children being separated remind Sarah of her own border crossing 15 years ago when she had to leave her young daughter behind for a time. They were reunited here in Chicago, where Sarah and her husband have since had three more children who are U.S. citizens. Sarah asked that we not use her last name because she now fears more than ever that she and her husband could be deported and their family torn apart. Through an interpreter, she says those constant worries are affecting their health. SARAH: (Through interpreter) There's a lot of stress. My husband's very stressed. He'll sleep for, like, a little bit and then he'll wake up. He has a lot of headaches. And it's hard for me to sleep. SCHAPER: Sarah says her children are feeling the stress and anxiety, too. SARAH: (Through interpreter) They know what's going on. It's very worrying for them. But on the other hand, we try to just live and keep going. But that's no way to live. SCHAPER: It appears such worries are on the minds of many immigrants these days. HANNAH BONIFACIUS: Did you see the news last night? SCHAPER: It's that question Hannah Bonifacius hears almost every day as she teaches English as a second language to immigrants on Chicago's Northwest Side. BONIFACIUS: Did you see the news last night? And I'd say, which story? And it's always about immigration. SCHAPER: Many immigrants in her classes have fled violence and are already stressed out about finding jobs, housing and education, so Bonifacius say facing new uncertainties about their legal status here can be traumatizing. BONIFACIUS: Our current climate is affecting their mental health for sure. SCHAPER: Mia Fioritto Rubin is Bonifacius' colleague at the refugee and immigrant resettlement agency World Relief Chicago and says she sees people walking in every day in a state of crisis. And it's not just those who are undocumented. MIA FIORITTO RUBIN: We have people who are - have already naturalized and been citizens for years who have come back to us and asked, could this be taken away from me? The fear is there for every single person who was not born on American soil and even some people who were born here but to immigrant families. There is the concern that somehow, some way they're going to be forced to leave. SCHAPER: The biggest fear, says Rubin, is the uncertainty of what's coming next. With new policies implemented in what she calls a capricious way, that fear can quickly turn to panic. RUBIN: We are absolutely seeing a significant increase in anxiety, depression, the - all of the physical manifestations of that, clients reporting to us that they're having severe headaches, an increase in blood pressure. SCHAPER: Many in the Latino community try to calm their fears with faith. 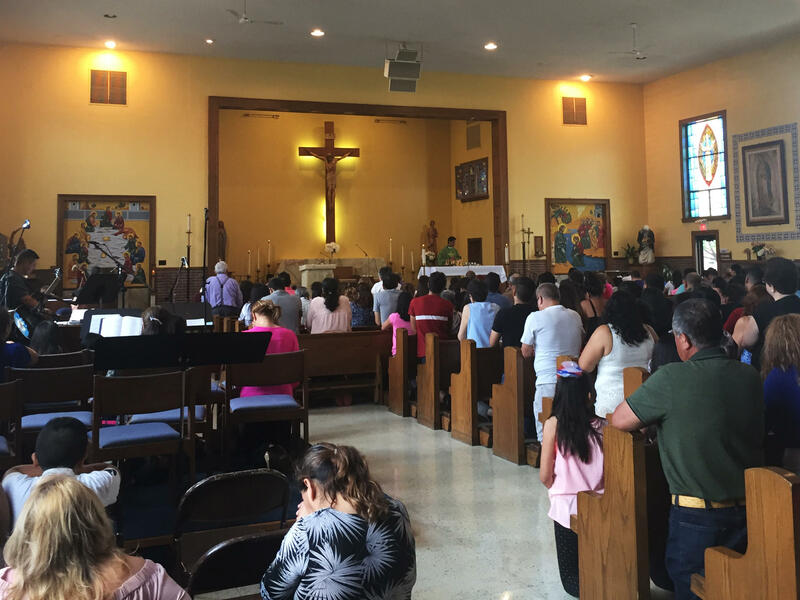 Here at St. Alexis in the Chicago suburb of Bensenville, parishioners during the Spanish-language masses often say prayers for immigrants detained at the border and for political leaders to provide justice. They light more candles before and after mass, and some kneel and pray at the grotto of the Sacred Heart in the courtyard outside of church. Father Matthew Nathan, the pastor of St. Alexis, says he's even blessing more religious figurines believed to help protect their families. MATTHEW NATHAN: The most common statues that I would bless after mass would be Our Virgin of Guadalupe, St. Jude, who is the patron of lost causes. And then I'll always get St. Michael the Archangel, the defender, the protector of those that are being attacked. SCHAPER: And under attack is exactly how many Latinos here say they feel these days. AMELIA CHAIDEZ: Oh, yes, absolutely. Yes, we feel like they're after us. SCHAPER: Fifty-three-year-old Amelia Chaidez been a U.S. citizen since coming here as a child. But she says in recent months, she feels more eyes following her as she shops. And she points to viral videos of white Americans screaming at Latinos to go back to their country even when the targets of such vitriol were born here. CHAIDEZ: I wasn't worried before. I was angry. But right now I'm beginning to worry. I think they're after us. I really do. SCHAPER: What gives Chaidez and others in the Latino community here hope is the strength they find in their faith, their family, their friends and neighbors as they pray that the anti-immigrant mood will soon lift. David Schaper, NPR News, Chicago. Transcript provided by NPR, Copyright NPR.